Do you ever wonder why all the healthiest things in this world are so un palatable or simply boring, well I do and surprisingly, boring the tasteless the thing is, it is for sure super loaded with nutrients. Well with Quinoa, I don’t know whether you had this experience but trust me to start with I did find it very boring and flat on taste. so much that I was constantly experimenting with this particular ingredient. well because Quinoa is one of the world’s most popular health foods. Quinoa is gluten-free, very high in protein and one of the few plant foods that contain all nine essential amino acids, isnt it the thing to have if you are looking for a Protein rich diet. In a pan add oil and bring it to boil , add Cumin seeds / mustard seeds, when they pop add onion and green chilly and keep stirring till they turn light golden, add Turmeric , salt and stir. Now add Tomato and green peas and quinoa and mix well and let it cook for 5-7 minutes so that all the ingredients blend well. 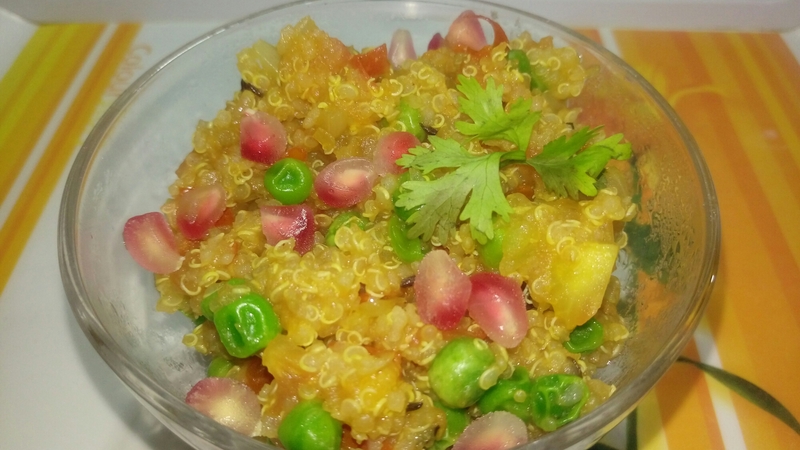 Now take it in a bowl and add Pomegranate , coriander leaves and lemon, toss well and serve.